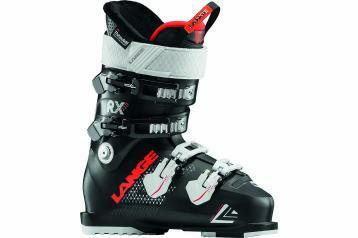 The 2018/2019 Lange RX 110 W was tested in the women’s All-Mountain medium width category at Silver Mountain Resort by the experts at America's Best Bootfitters, powered by Masterfit. The 2019 Lange RX 110 W returned to this year’s boot test unchanged, save a cool, understated new graphic that testers liked. What definitely didn’t change is the fact that it remains one of the most dominant boots in the highly competitive narrow All-Mountain group. Testers love that the MV and skinny sister LV fit noticeably different in volume but share the same family fit and performance characteristics. Testers say the MV holds the heel and ankle with authority but opens the fit elsewhere to comfortably suit the average foot and leg shape. Testers say the RX 110 W is a benchmark for medium width fit characteristics without giving up on performance goals—meaning Lange hasn't blown-out the toebox and forefoot and fluffed-up the liner just to attract the wannabes. Testers say this top-shelfer fits like a Recaro seat built around the foot—firm and close in the heel and ankles and boot throat, like a custom foam liner a couple testers said. There's just enough room elsewhere to suit the average, medium-volume foot and leg, but without namby-pamby down comforter pandering. This one grabs on and holds ya. You're skiing all day, not mucking around in the lodge! It's Lange's story again this year and it's where this medium really elevated above the rest. The pre-sculpted 3-D liner's exterior matches the interior of the shell in a mirror image, mating the foot and leg to plastic and transmitting every skiing movement to the skis. Testers said the boot knifed through all manner of junk off-piste and drilled hard snow like a power tool. The delivery to the edge was impressive, they said, but easily matched by the boot's snappy energy and feel for the snow underfoot, too. This power and agility combo can be attributed to the RX (and RS) line's Dual Core shell and cuff which utilizes a unique production method to sandwich a less-dense plastic within the shell wall itself to create a more energetic, resilient feel—testers gave the nod to it again this year. The RX 110 W is about what matters and nothing else—so you get a Velcro power strap, 4 aluminum buckles (2 are easy-open ones on the bottom, nice with gloves on), a single-side cuff adjustment mechanism and replaceable Max Grip soles. The option is there to upgrade to GripWalk soles for 50-bucks if you have appropriate GripWalk bindings to suit. Oh, and the Dual 3-D Pro liner has Thinsulate in it. Sure, warmth matters.